Getting the job done right the first time is paramount, and it all starts with one of the most critical processes—compaction. Demolition of in-ground swimming pools involve backfilling the cavity with clean fill material, which is typically soil. When soil is broken free from the ground, air molecules enter the soil and cause the soil to fluff (expand) by as much as 30%. The key to a successful backfill of a swimming pool cavity is proper compaction achieved by using proper equipment and compaction methods. Poor compaction can result in settlement of the soil. This creates future maintenance issues. The soil placed in the swimming pool cavity is full of air molecules. Air molecules will eventually go away on over time, the soil will self-compress, also known as settlement. The objective is to take steps to aid in preventing settlement. Many contractors will tell you they are going to “compact” the fill material, but with what? Many contractors believe that simply driving their skid steer loader (Bobcat) over the loose fill material is a sufficient compaction method. This is not true, driving a skid steer loader is not the correct way to achieve adequate compaction. A skid steer loader does not create centrifugal force, which is necessary to push the air molecules out of the soil. The most effective way to achieve maximum density compaction of fill material is by using a vibratory soil compactor, such as a trench roller. The vibratory drums hit the ground with much greater force than their static weight. Over the years I have found that most people in the market to have their swimming pool demolished and filled in, do not give serious thought about how the fill material will be compacted. When the fill material settles it will require additional backfilling, and the additional backfilling will require grass seeding and watering again, as well as potential water problems. 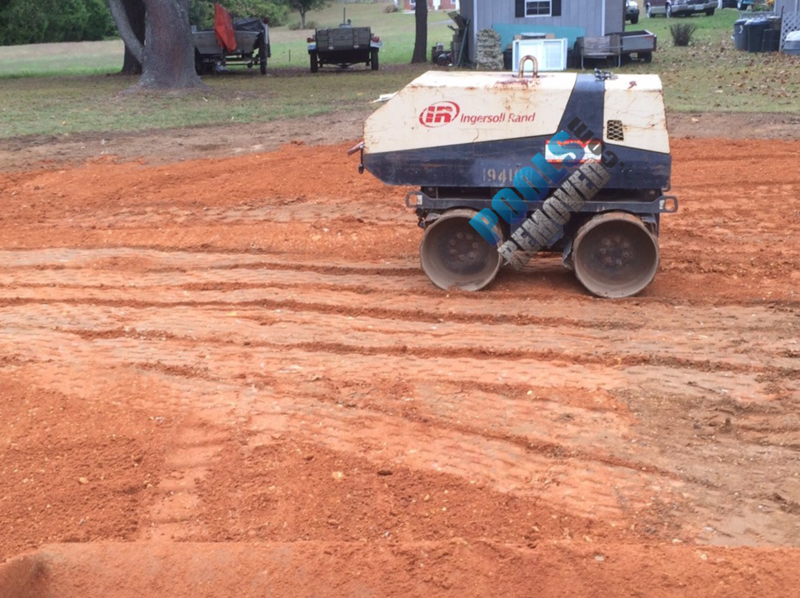 A dedicated soil compactor should be on site and part of your swimming pool demolition / removal project. A dedicated soil compactor on site is par for the course of demolition and backfill of a swimming pool just as a ladder is par for the course with a house painting job. Disclaimer: Consult with a licensed geo-technical engineer if you are planning to place anything structural over the swimming pool cavity.